23-year-old female with no significant PMH, BIBA, after experiencing syncope at home. Patient now has chief complaint of LUQ pain that radiates to her shoulder. Onset of symptoms were 1 hour prior arrival. Pain is characterized as persistent and dull. Patient denies any other complaint. In this patient with abdominal pain and hypotension after a syncopal event, what are your initial differential diagnoses? This patient is s/p a MVC one day ago with major damage to her car - does that alter your differential diagnoses? In the video and image below, what are the findings? What views should be obtained in an e-FAST exam (be specific). Besides an e-FAST, what other ultrasound studies should be performed in a hypotensive patient? It brings traumatic etiologies (perforated viscus, solid organ injury, occult retroperitoneal bleed) to the top of the differential diagnosis. However, it is still worth considering medical etiologies that cause recurrent syncope, which may have precipitated the MVC in the first place. Free fluid in the RUQ: at the tip of the liver, inferior to the kidney, orrison's pouch, surrounding the liver above the diaphragm, as well as free fluid to the right of the bladder. LUQ: same as RUQ, except instead of assessing the tip of the liver, you are assessing the tip of the spleen. 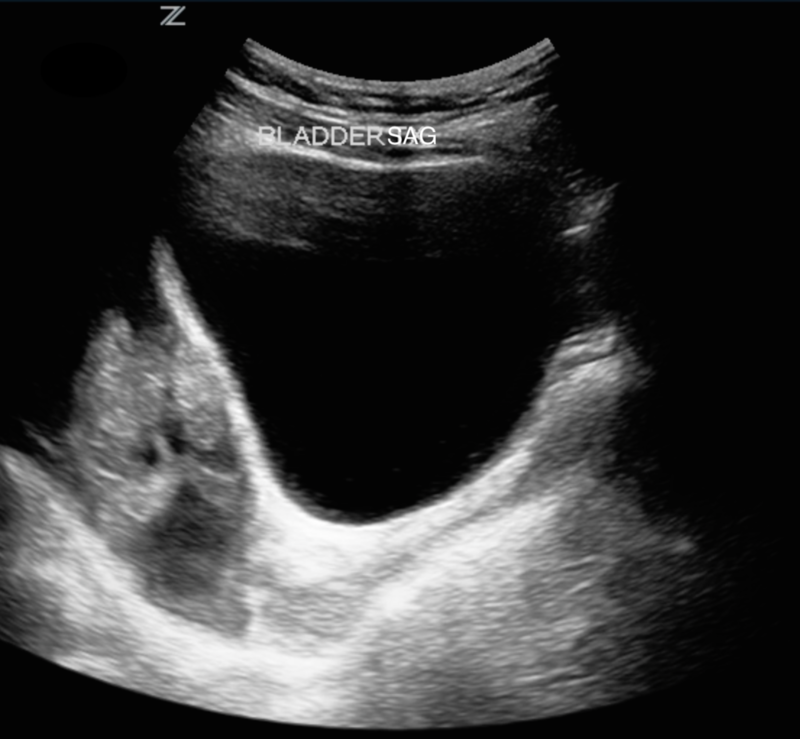 The probe often needs to be positioned more superior and posterior (compared to where you position the probe in RUQ view) in order to bring the spleen into view. Subxiphoid: bring the probe to a nearly flat position--15 degrees perpendicular to skin--in order to bring the four chambers into the best view possible. Having the patient bend his/her knees as well as taking a deep breath may help. R and L chest wall: put probe onto the chest wall with the probe marker towards the patient's head. in b-mode, assess the pleural line for lung sliding. Then switch into M-mode where you may see the "barcode sign" (aka "stratosphere sign") indicating pneumothorax. The "seashore sign" (indicating lung sliding) decreases the likelihood of pneumothorax in the right clinical setting. ardiac, abdominal aorta, respiratory (pleura and lung), and assess for possible pregnancy, including areas of a possible ectopic pregnancy.